Walks in Mount Victoria area. 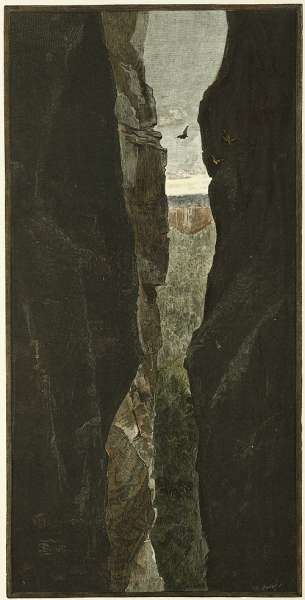 Pulpit Rock, Little Zigzag, Bushranger’s Cave, Rienit’s Pass, Wilson’s Glen, Ross’s Cave. Coming from Sydney go through the traffic lights at Mt. Victoria and take the next turn left into Kanimbla Valley Rd. Take the next turn left into Victoria St and then right into Innes Rd. Continue to the end of Innes Rd which in effect becomes Kanimbla Valley Rd. Find a parking spot near the last houses and continue down the dirt road keeping an eye out on your left for the very short side track to Pulpit Rock which provides a wonderful view of the Kanimbla Valley across to the cliffs of Mt. Blackheath and beyond as far as Kanangra Walls. You may even see a hang glider or two circling in the vicinity of Mt.Blackheath from where they take off. Continue to the end of the dirt road which becomes the wide foot track known as Little Zigzag. Proceed down the hill and you will soon come to a marked side track on a sharp bend. This is known as the North Track and is mainly used by rock climbers. I’ve never walked far along this track so I have no idea where it leads to. Continue on down the main track and keep a lookout for a painted rock sign on the left at another sharp bend saying “Bushranger’s Cave”. This is well worth a look and has been used by climbers and others as a base camp. It is quite large and opens out to good views of the Kanimbla Valley. After this short diversion continue down the main track to the bottom of the zigzag section, keeping a lookout for a track on your left as you head in a southerly direction. This side track takes you in an easterly direction and was signposted last time I did the walk. It is not indicated on either Topo map but is clear and easy to follow. If you hit a dirt road you’ve come too far and missed the side track by about 500 metres. The track leads you around and climbs up to the base of the cliffs. The cliffs around here are very popular with rock climbers who can be seen and heard getting their adrenaline rush on most weekends. From the base of the cliffs turn left to Reinits Pass (MW450788) and Wilson’s Glen keeping an eye out for Ross Cave which is beside the track. The track eventually brings you out onto Carlisle Street. Follow this back to Victoria Street and then Innes Rd/Kanimbla Valley Rd and the cars. A more pleasant exit is to head back down the track from Ross Cave for about 300m and take the rather vague (initially) cliff top track to your right which heads west for about 400m back to Pulpit Rock. Fairy Bower Picnic Area, Cox’s Cave, Mt Piddington, Fairy Bower. Easy. Allow a couple of hours. As you approach the township of Mt Victoria, coming from Sydney, you will cross the railway line via an overpass bridge. Put on your car’s left indicator here. Almost immediately on your left you will see an old sandstone tollhouse. Turn hard left off the highway here into a dirt road (Station St.). This shortly (within 100m) descends to a lovely bush picnic area where you park your vehicle. You will see the signposted Fairy Bower track heading south through a lovely rainforested gully. After about 400 metres you will notice a side track on your right. Take this track to the magical Fairy Bower where there is an old wooden picnic table and seats in a small amphitheatre with a small waterfall and shallow wading pool. A lovely cool spot to take the family in summer. After spending some time here you can simply return or continue up the track which climbs up towards Mt Piddington. If you continue up the track keep an eye out on your left for a track junction which leads you back down the hill and through another gully past Cox’s Cave. Cox’s Cave is worth doing but involves climbing up a steel ladder so you have to warn the kids to stay well back from the edge once they ascend the ladder. 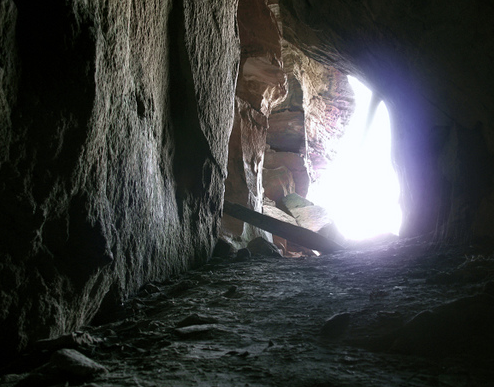 A short distance down and around to your left, after the Cox’s Cave ladders, you rejoin the main Fairy Bower track. Turn left here and head North back up the gully to the picnic area. Another feature of interest below Cox Cave is an old wooden signpost labelled “Dunns Leap”. Fixed to the top of the signpost is an old rusty wire which stretches up to the top of the cliff face 181ft above (200ft according to the old sign). The wire indicates the direction of a fall taken by 14 year old Charles Dunn in May, 1908 while mucking around with his elder brother and a friend in a cave high above. Apparently the boy not only survived to tell the tale but was relatively unhurt with just a few grazes/scratches and got up and walked home while the others came down to search for the ‘body’*. To locate the old track to Dunns Leap look for a triangular blaze mark on a coachwood tree beside the track about 20metres below Cox Cave. Descend down this side-track for a few metres looking for another triangular blaze mark on a coachwood. A couple of more trees are similarly marked and by this time you should be on a well established track below the cliff line, which will soon (5 minutes?) get you to the old wooden signpost. Return the same way to the main track. Mt Piddington (MW456786), Hourn Point (MW45177), Rienits Pass. Because I hardly get near my computer and I’m just learning html it’s going to take ages to get in a description of each walk so I’m just going to give the map references and very basic descriptions. Exits for this walk are the same as for walk 1 above. The descent from Hourn Point is easy and is mainly used by rock climbers. The track at the base of the cliffs around to Reinits Pass is straight forward. From Rienits head straight up Wilson’s Glen, past Ross Cave and onto Carlisle Pde. Head south along Carlisle Pde back to Mt Piddington where you left the car. On the way out along the dirt road to Hourn Pt you may notice a small stone cairn on your right beside the road. If you turn off the road here to your right you should stumble on an old overgrown road. Follow this for about a hundred and twenty metres down the slope and keep an eye out on your left for the old convict pit(GR452781). There is a second pit further down the hill and well over to your right. Both pits are now partly filled with water but are identical in all other respects to the convict pits at Blackheath near hill 33. (a) Victoria Falls Lookout (MW486816), Victoria Falls and return. (b) Grose River, Blue Gum Forest (MW548777), Perry’s Lookdown (MW537788). Medium/Hard. Full Day 6-8 hours. Car shuffle required. (a) The walk begins with a steep descent from the lookout, through the low cliffline and down the talus slope but the track itself zig-zags to make the descent a reasonably easy gradient. As you approach the bottom of the hill you should notice a side track going off to your right. This is well worth doing as it is only short and leads to a lovely swimming hole right in the creek. Don’t stop at the first pool you come to but keep going up the creek for another two pools ie the third pool. After a swim get back onto the main track and continue the descent. Within a couple of minutes you will come to another track junction. Again take the side track on your right which shortly leads to the base of some lovely high cascades. Get back onto the main track and continue down past Victoria Falls and into the creek. From here you can walk up the creek to the base of the falls or just cross over and keep going along the main track, which goes beside the right bank of Victoria Creek till it reaches it’s junction with the Grose River. If you continue to option (b) make sure you get an early start from Victoria Falls Lookout (8-9am) and take about 3 litres of water as you will need at least 1.5litres for the steep, hard ascent of Perry’s Lookdown. The track stays on the right hand bank all the way unless you wish to camp the night at Burra Korain flat (not recommended) You may fill your water containers from Crayfish Ck. where it crosses the track but definitely NOT from Hat Hill Ck. which carries Blackheath’s sewerage into the (by now very) Grose River. An attractive feature not long after crossing Hat Hill Creek is the masses of Flannel Flower and a little further on the Grass Trees(Blackboys) covering the hillside on your right. About 2km before you reach Bluegum Forest you will come to a delightful clear grassy spot almost opposite Mt Banks, with a few large bluegums(Eucalyptus deanni). This spot is known as “Little Bluegum Forest”. Clean water can be obtained just downstream from here by crossing the Grose River on purposely placed river stones and walkling a few metres downstream to Banks Gully Creek. Cross back over to continue down the main track. Clean drinking water can also be obtained from Hordern Gully creek which crosses the track at MW551788. The ‘hard’ part of this walk is the climb back up to Perry’s Lookdown after a fairly lengthy (10km?) walk. Just take a few rest stops on the way back up. 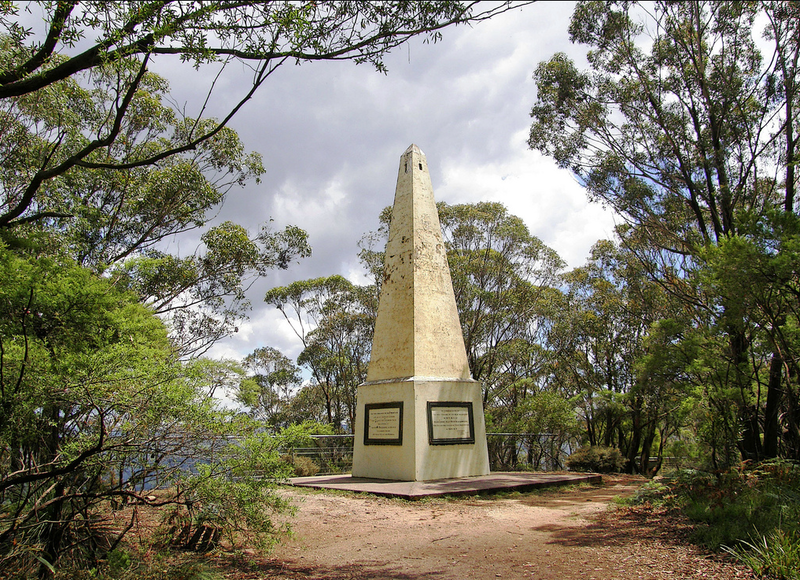 At the top there is a memorial to four young boys, aged between 13 and 18, from Belmore Church of England Boys Society who lost their lives nearby in the bushfire of November 30, 1957. An American tourist also lost his life near this spot during the fires of November 1982. The message is quite clear: if a fire is noted in the area do not attempt to climb out. Get down to the river and find a clear area to wait until the fire passes and has cooled down-a surprisingly short period of time. In the 1982 fire two Scandinavian fellows did just this and walked out the next day, none the worse for having spent the night in Blue Gum forest. The best time to do this walk is from mid to late October when the wildflowers are out. Victoria Falls Rd, old dirt road, Asgard Swamp and Mine. Travelling along the highway from Blackheath towards Mt Victoria turn off onto Victoria Falls Rd (MW460791) and follow this dirt road for approximately 4km, keeping an eye out on your left side for a couple of old dirt roads. Park at the second one (MW478822) which has had 4WD access blocked by NPWS with a bar gate. Head down the track for 2km till you come to the lovely wide Asgard Swamp. It’s worth doing a bit of exploring around this interesting area if you have the time. Continue along the track for a few hundred metres and you’ll come to a signposted foot track which takes you down to the old coal mine (circa 1881) and brick retort (MW491836). The adit doesn’t go in very far but it’s best to stay right out of these old mines for safety reasons. Return the same way. The various ridges and gullies running off either side of Victoria Falls Rd make for some short, interesting’exploratory’ walks eg. the obvious ridge running out to Ikara Head (MW476848) , with it’s accompanying foot track, is worth doing. Valhalla, Thor and Asgard Heads all have great views of the Grose River gorge. I’d been told that old Mr Rienits, a school teacher who had an interest in the mine and much of the land around here was keen on Wagnerian Operas and thus you get named features such as Asgard, Ikara, Valhalla, Thor, Odin etc. According to Brian Fox, a cartographer who has done a lot of research on place names in the Blue Mountains, this is incorrect. He claims most of the features were named by Myles Dunphy. Another good story ruined! Historic Walks off Mt York Road. Hampton Topographic Map. As you head west along the highway through Mt Victoria keep an eye out for Mt. York Rd. on your right (almost 1km after the traffic lights). Follow Mt York Rd for 1.25km and you’ll come to a signposted area on the right side of the road where you can park your car and start any of the following walks. a. Berghoffer’s Pass (1907-1935). Easy. Approx.5km return. A lovely signposted short walk with great views of Hartley Valley along a pre-World War One road that was built for the early motor vehicles which couldn’t negotiate the steep grades of Victoria Pass. John William Berghoffer (1840-1927) was the first elected President of the Blaxand Shire in 1906. In 1916 a law was passed in the NSW Parliament that prevented any person of enemy origin from participating in Council. This effectively disqualified Berghoffer who was born in Munchausen, Germany, emigrating to Australia as a 15 year old. b. Lawson’s Long Alley (1822-1827) (top section and return) Easy. Just walk down the 1.5km to the large swamp area and return the same way, keeping an eye out for the interesting convict stone work at the beginning of the descent. Many people walk the whole track combining it with the Lockyer’s Track to do a round walk of 5-6 hours but I personally find it boring and tedious to walk the 3kms of dirt road along the valley floor. Named after William Lawson of Blaxland, Lawson and Wentworth fame. c. Lockyer’s Road, Cox’s Road round walk. Medium. This makes quite a pleasant round walk of approx.10kms including (unfortunately) 4km of sealed road bash if you only have the one vehicle. Cox’s Road was of course the original road built over the Blue Mountains around 1814-15 and much of the original cuttings and pick marks can still be seen. One wonders how on earth the early coaches descended this pass, often towards dusk, to stay at the famous Collit’s Inn (H420855) for the night before moving on to Bathurst. Lockyer’s Road(1828-1829)was never completed, thanks to the intervention of Major Mitchell, but there is some interesting convict built stone walling at the Hartley Vale end. Mount York itself is heavily patronised by the rock climbing/abseiling community and has been the site of some tragic accidents in recent years. If you want to watch the climbing activity, stay well back from the cliff edge – at least a body length, don’t leave anything near the edge eg camera/raincoat, and HOLD ONTO YOUR KIDS! Both walks are well signposted. Mount Victoria to Sugarloaf Mountain. This is a rarely visited but very interesting area to explore, with plenty of rock pagodas and great views.Take at least 1 litre of drinking water. Coming from Sydney drive right through the town of Mt. Victoria and continue along the highway, do wn Victoria Pass until you are almost at the bottom where you will see a truck emergency area and ramp on your left (H423805). Pull over here and park well away from the ramp. Walk South East up the small gully to your left for a while and make your way up the slopes to the right of the gully till you edge around under the cliffs to the southern end of Mt Victoria at approximately H425811. From here head NorthEast and scramble through the interesting rock formations to traverse Mount Victoria for about 500 metres. Return to the southern end of Mount Victoria and continue south along a knife- edge saddle of chert rock and up onto the unnamed peak at H417792. From here head NorthWest for about 1km to the northern end of Sugarloaf Mountain at H411800. Again have a good look around before making your return. On your return head down the wide gully at 422796 and continue south for about 900metres, past an old shale mine site, until you come to a fenced quarry site. Go to your right and climb up around the high side of the quarry and continue till you shortly reach the highway near where you parked the car. Extreme care is required when re-entering the highway as the traffic flies along here. It’s probably safest to head towards Hartley and find a safer spot to pull over and turn around in order to head back up Victoria Pass. This inclined railway was constructed during the 1920’s to to transport chert (a type of siltstone crushed and used as a road base) from a quarry in Kanimbla Valley up to the railhead at Mt Victoria. Park your vehicle in the Fairy Bower Picnic Area (see walk 2 above and sketchmap below).Walk in a southerly direction along the dirt railway access road for about 500m keeping an eye out on your right for two large concrete blocks, with vertical stud bolts, in the bush (GR460785). Walk over to these blocks and look to your left for a large tree stump about 20metres away. Go to this stump and opposite it there is a foot track. Follow this downhill and you’ll soon realise you are following the bed of the old chert inclined railway. It gets very steep and as you approach the cliff edge you will see some of the old rail sleepers “bridging” the small creek(see photo at left). Return the same way. The bottom section of the railway is a lot more difficult to locate and I am not going to give details as it’s very rough and tricky to find. The termination of the railway is approximately 1.5km down Fairy Bower Creek. (easy Mt Wilson 462781) and Pass (rough 460779) See the sketchmap above. Walking from the Fairy Bower picnic area head South along the railway access road for about 900m till you approach the second locked gate. Don’t go past here! About 40m before the gate and over to your right (west) you will see a metal sign on a pole with a footrack at the top of an embankment. Just follow the track till it comes to a semi-cleared area where rock climbers (or a local adventure company) have set up log seats etc. Follow the track over to your left and down where it passes under a cave (rock overhang) and descends through the cliffs and down a gully. Soon you have to make a choice whether to continue down the creek/gully or sidle to your right round the base of the cliffs (rough, obscure footpad) or just return the way you came. I chose to sidle around to the right at the base of the cliffs until I soon passed under a cliff-high but shallow waterfall and then worked my way carefully down and across the scree slope to get into Fairy Bower Creek. It was a bit rough and I came upon the old Chert Rail way bed/cutting contouring it’s way southwest across and down the slope. Crossing Fairy Bower Creek you are soon on the old walking track which takes you back up towards Cox’s Cave and out to the Fairy Bower picnic area. When you get back up on to the main track near Cox Cave look back at the cliffline from where you descended and you’ll see a tall section of rock/cliff separated from the main cliffline which looks like it could be a pass. It is but I don’t recommend it. If you want to do it approach it from the bottom. I did it from the top and found it difficult and dangerous to negotiate the lower cliffline from the base of the main cliff. The main section of the pass is quite safe and straightforward with a short (2m?) fixed rope with loops to assist up near the top. Once at the top of the pass work your way round to your right till you cross a dry creek bed and join the foot track back up to the railway line.